Our client Inada USA has made it even easier to buy one of these luxurious massage chairs — now you can order online. 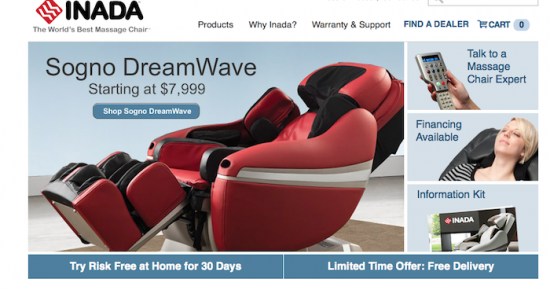 The new e-commerce site, developed by TCA, lets customers select and purchase their own Inada massage chair, including the flagship DreamWave™, the rocking Yu•Me and the new Flex 3s, which combines stretching with massage. Site visitors can also request a free information kit on Inada’s line of massage chairs. The “Find a Dealer” feature lets users locate the nearest authorized dealer and also provides a coupon for a free demo in an Inada chair. The site has detailed information on the functionality of the Inada massage chairs and also connects to InadaUSA.com, where users can find more in-depth information about Inada’s proprietary features and award-winning design as well as the company’s three- and five-year warranties.